One of the last mares out of the full sister to starshire Rohdiamant/Royal Diamond !!! Her siblings are licensed breeding stallion, Intermediaire II successful sport horses, elite mare etc. Picture perfect Oldenburger dressage/broodmare mare 2009 by Dr. Jackson/Rubinstein appr. 164 cm with the highest rideability index in her pedigree. 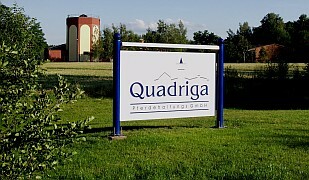 Out of world-famous dressage dam line! Ideal amateur and youth horse! Uncomplicated and great work ethic. Always ready to give her best effort, she is very easy to ride with a wonderful character, outstanding gaits and a very soft mouth. Her elastic, swinging movements and hind leg activity are fantastic. 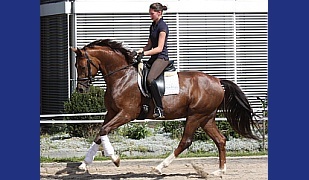 Mare was trained at second level dressage but was not competet. 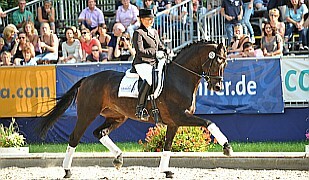 But her talent and potenzial for the highest level of dressage was obvious. Not riden the last time because she should be insaminated now. 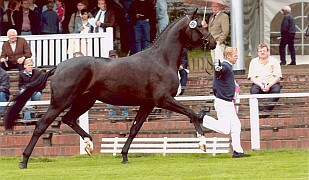 Her sire, Dr. Jackson, was 11 years in the top 1 % of the German breeding list . 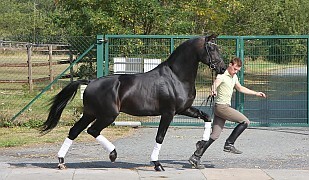 Her dam is one of the most important broodmares in Germany. She is elite mare, dam of a licensed stallion (Jazz Rubin) and the full sister to the top stallions Rohdiamant and Royal Diamond. This is the Elektia dam line, which is one of the most important lines in the world. Another brother currently performs at the Intermediaire I level, and another sister is an elite mare…and the next two generations include even more elite mares. In short, this pedigree offers a breeding assurance second to none. More genetically anchored rideability in one pedigree is hard to find. Her siblings are licensed breeding stallion, Intermediaire I successful sport horses, elite mare etc. 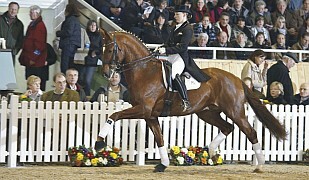 A rare gem for dressage and breeding at the highest level!